Are they going to get the job done right? Are they gonna protect your home properly? How about their warranty? Are they gonna deliver on it? These questions as well as many other will come to mind prior to hiring a flooring contractor. We understand all these which is why we've decided to give you a glimpse at our past. Hopefully, this will give you an idea on who we are and how we got here. In 1999, we've started working for a flooring company here in Chicago. While working in the field, in those four years, we've noticed something that is still very obvious today for every person that decides to start a flooring project or almost any type of home improvement project for that matter: the complete lack of interest in quality on the side of the company owner. Their lack of care for the homes we were working in was mind boggling to us. Thinking that our boss was an exception, we started asking around and found out that almost everyone had the same approach. "Go in, finish it quick, get paid and get out. " Realizing the need for a company that cares for their customers, we've decided to start our own small flooring business. We knew right from the begining that we needed to implement a diferent process than the one used by most flooring contractors. To Read More About Our Unique Aproach, Please Click Here! Our first crew was made out of two people, the two of us, and our tools were basic, second hand tools. Even though, doing the installation, finishing, marketing and taking phone calls in the same time seemed overwhelming at times, we were determined to succeed in offering Chicagoans the wood flooring services we believed they deserved. With very small steps and generating most of our business from referrals we managed to get through 2003, surviving what we believed was going to be the hardest test: the beginning. By the end of 2003, we managed to save enough money to upgrade our tools and hire the two extra people that we desperately needed. The new tools we managed to buy with some of the money saved in the previous year allowed us to start working faster, cleaner and more efficient. The two people we added to the crew, allowed us to take a step back from the business and take the time to analyze. What could we improve, what area of this business could we change to offer you, the customer, more value for your money? This is when we realized the importance of flooring cleats, and their positive impact in the life of a hardwood floor, in comparison with the flooring staples everybody uses all the time. The grooves on the side of the flooring cleats are designed to ensure that the wood fiber will hold the cleats in place way longer than it would hold the flooring staple. This would ensure a long lasting floor, free of squeaks and major cracks unmatched by any flooring staples available on the market. By switching from flooring staples to flooring cleats we knew we were going to install stronger wood floors, free of squeaks for a much longer period of time. Contact Us For a Free, No Obligation, Estimate! The quality of our work started paying off and the number of requests kept on increasing. In order to keep up with the high volume of requests from our customers, we've decided to add two more installers to the crew. 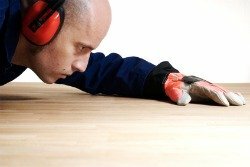 Hardwood Floor Sanding, Few Steps Your Contractor Will Try to Skip! Engineered vs Solid, What Should You Choose? When it comes to engineered vs solid flooring, most people decide based on price. But is this the best way to make a choice? There is more to it than that... Understand the differences between the two, the pros and cons of each one of them and, most importantly which one is recommended for your house, prior to buying... Click here for details! Design, wood species, durability and installation style will, all, play a role in the overall look of your home after the installation is completed. Get a grasp of these factors and how will they affect your wood floor for years to come... Click here for details! Selecting the Right Wood, What Should You Know? There are hundreds of flooring types out there, from exotic to domestic, unfinished or prefinished, engineered and solid, green or not so green. With so many options to choose from, selecting one could feel overwhelming. But if you know what to look for and if you follow the proper steps, selecting wood floors can be easy and fun... For more details, click here!